Storing fruit is a great way to prolong the season and avoid having to eat all your fruit at the same time. If you have a particularly large harvest, or glut, in any one year, storing makes it easy to deal with all the extra fruit you will have. In the winter months, a stored apple or pear can provide a delicious antidote to the cold weather, and they’ll taste much better than the fruit available in supermarkets, which may have been stored for up to 12 months. If you want to store your fruit, you need to keep it in a cool, dark, well-ventilated place, such as a cellar, garage or garden shed. There needs to be a degree of humidity so the fruit doesn’t dry out, but not so much that the fruit goes rotten quickly. The cool temperature temporarily halts, or slows down the decomposition process, so – like keeping food in a fridge – you can keep your fruit for longer. The type of container you store your fruit in is very important to the length of time you can keep your fruit, and how well it stores. Tree fruit, such as apples and pears, stores well in containers that provide plenty of ventilation, so air can circulate around each individual fruit. There are various designs on the market for the home fruit grower. These include specially constructed slatted wooden shelves and wooden orchard boxes. Prices start from around just £15 for a standard one; rising to around £40 for a more commercially sized one. For those on a budget, tree fruit can also be stored in crates. 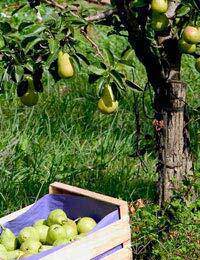 Simply lay the fruit in a single layer in a crate and stack them so they take up less space. You can use wooden or plastic crates, as long as they have plenty of room for ventilation. You can even use polystyrene trays to store fruit. Holes can easily be punched into the polystyrene if there isn’t adequate ventilation, and, providing you maintain cold, dark, mildly humid conditions for the fruit, it should keep as well as it would in a specially designed wooden shelf set. Apples store well if individually wrapped in newspaper or tissue paper. Simply wrap each apple in the paper and place them in a single layer on a shelf, or stacking system. Polythene bags are also suitable for storing apples, and can be especially useful if the atmosphere in your storage area is dry (this can cause the fruits to shrivel). Make sure the polythene bags are perforated so air can still reach the apples, and ensure the room is not too warm, as this can cause condensation to appear on the inside of the bag, causing the apple to rot. Pears do not like to be individually wrapped. Some fruit is better stored in the fridge, as it has a much shorter shelf life. Fruits suitable for storage in the fridge include cane fruit such as blackberries and raspberries, bush fruit such as blackcurrants and blueberries, and small fruit such as grapes and strawberries. These fruits also need a degree of ventilation, and are best stored in paper bags on a slatted shelf. You can also store them in freezer bags and Tupperware containers. Fruit stored in this way may last a week or two. Whichever method of storage you choose, inspect your fruit regularly, as one rotten apple can spoil the whole crop. With the right conditions, your fruit should last much longer than it would in its natural conditions, providing you with a longer season in which to enjoy your home-grown fare.